Mosaix is a revolutionary Nesting software which provides layout optimization of 2D and 3D geometries for all kind of shapes and material. Unique from other nesting products, Mosaix allows the user to exclude damaged or scratched areas (e.g. scratches on plastic surfaces, lesions of leather, wood, etc. ), or keep parts of the surface for other uses. 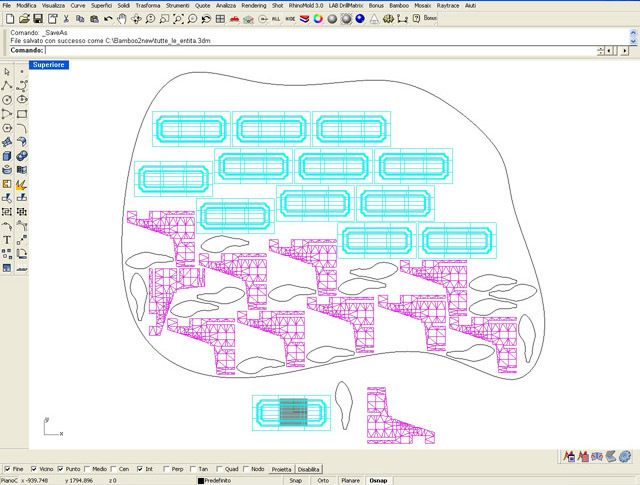 Mosaix is fully integrated into Rhinoceros and requires only a basic knowledge of the program. Mosaix provides management and calculation on the development of bidimensional (multiple lines, spline, lines) and tridimensional (solids, surfaces, mesh) entities. 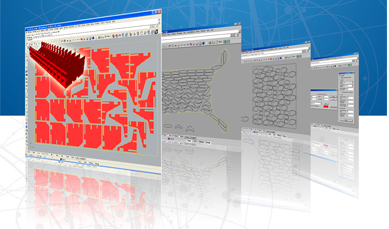 Mosaix can optimize on the same area different kind of objects, either 2D or 3D, without any need to move 3D entities. Mosaix reaches a high grade of usability in the 3D project field bringing automatically on the XY plan all the objects lying in the space; therefore it is possible to do the nest starting from the 3D models themselves. 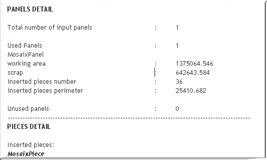 It is possible to set an array of parameters like maximum and minimum number of pieces, insertion priority of every single unit or mirrored pieces. Before operating nesting, Mosaix will ask for the minimum distance between pieces, the distance from the external edges, the first and second angular value allowed for the figure rotation during the nesting procedure and the layer where the nesting result will be placed. 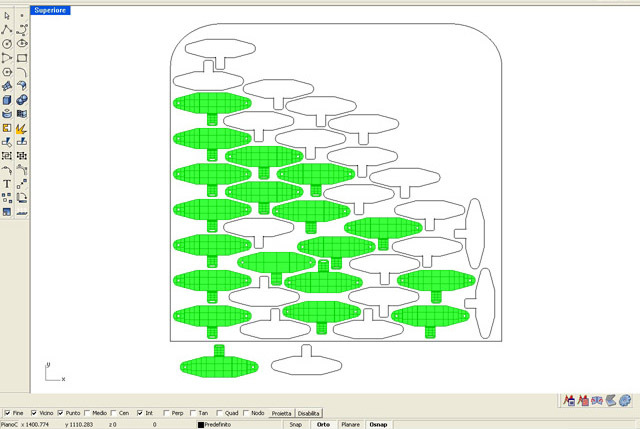 Mosaix provides the possibility to compute the perimeter of the remaining areas, whose surface should be used in future productions. At the end of the nesting procedure, Mosaix shows an informative report with the total number of pieces, needed quantities, pieces inside and outside nesting and details of inserted pieces. The report, if needed, is printable in just one click. 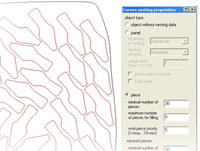 Mosaix allows the management and calculation of the development of two-dimensional entities (polylines, splines, lines) and three-dimensional (solids, surfaces, mesh). Mosaix also allows to optimize on the same area more types of objects, both in 2D and in 3D, without the need to translate the three-dimensional entities. Wherever you need to save expensive material, of both the cutting machine and the cutted material, you need a professional tool to nest the project the best possible way. Mosaix offers the most efficent way to do that. Besides, you’ll save time and effort while working inside Rhinoceros, because with Mosaix you’ll nest your 3D and 2D entities directly inside your own project, with no need of changes, rendering and so on, just use the automatic flattening option and the program will do the work for you, as simple as pressing a button. While working on large surfaces, creating very big entities, to save material is a priority. This way, we created Mosaix thinking about all the users which can only work on the computer, in a 3D environment, where they realize a project that takes a lot of time to be completed. Mosaix allows you to think only about your project, because it will take care, in the best way, of the whole nesting process, starting from your 3D model: Mosaix will take it, will flatten it down and will nest all the pieces on different panels, as many times as you need; after that, you’ll get the whole array of your pieces nested on the provided surfaces, and a detailed report that shows you what Mosaix has done. Mosaix is the definitive application for who works in the engraving area for it’s exclusive ability to nest everything on every surface of any shape; you won’t need to separate the profile to cut and the profile to engrave, because Mosaix can operate with all the kind of profile you’ll ever need. Moreover, whenever you’ll do an automatic nesting procedure, you’ll get a very detailed report about the whole work you have done. One of the best application for a nesting software is without doubt the leather field. As you know, leathers are never the same, so every time you cut you have to repeat the whole optimization process, wasting time and, most of all, material. Mosaix is the perfect tool for the leather nesting, because you can nest the project’s entities on irregular surfaces of any nature, you can exclude some areas from the surface to be nested (imagine a portion of leather scratched or holed) and then you get a detailed report of all the work Mosaix has done. As leather, fabric too presents the same problems, easily solvable with the help of Mosaix. Mosaix is useful when you need to save time and material. With Mosaix you’ll get the best result when you need to place complex shapes, like figures, packagings or letters on adhesive paper, and you cannot waste precious material. You don’t need to know lot of 3D modeling techniques, because using the optional RaVe module you can do nest starting from raster images or even from your own freehand drawing. Using Mosaix your projects will surely improve more than you can imagine. Mosaix is in continuous development due to continuous requests/suggestions coming from our customers. If you got a great improvement in your work from Mosaix please contact us and tell us about your experience. If you think you need a nesting software but Mosaix doesn’t match your requests we should have the solution for you, ready before you can ask. RaVe is an optional module for converting raster images (such as jpeg, bmp, gif and png) into vectors, for both 2D and 3D use. 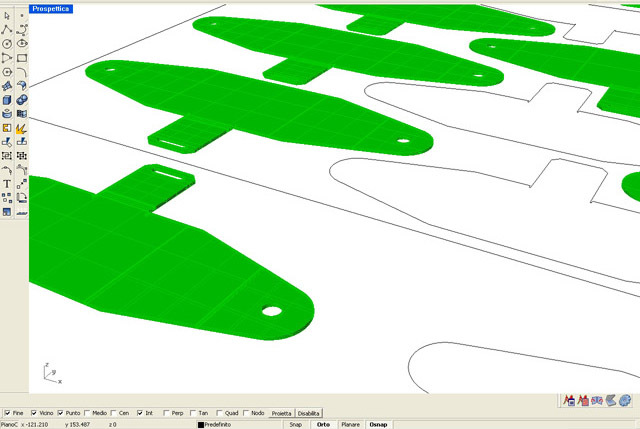 Bamboo is an optional module for the generation of cutting toolpaths for different technologies available on the market.